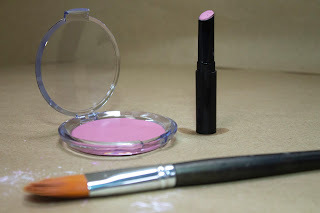 This blog post offers a recipe and tutorial for a lightweight blendable and buildable blush with a semi-matte sheen. Vegan, uses Sunflower and Rice Bran Wax. How to incorporate pure pigments into a recipe with the least amount of speckles. Melt the Phase A ingredients together and set to the side. With everything in a bowl, use a strong spatula to smoosh the pigment grains in to the oil. It may take a lot of smooshing. Put everything into a small zip lock bag and rub vigourously between the palms of your hands. Use a spatula and muller and grind the pigment into the oil. (Probably you won't do this, but its just an FYI. Here is a little video showing the last technique, although they are making paint. After you have fully mixed the pigment into the oil. You may want to swatch it along a piece of paper (called a Draw Down Test) to make sure you have no speckles. Now is the time to get rid of all speckles of colors. Don't cross your fingers and hope they will go away in the final the blend, they probably won't. OK, now add the Phase B to the Phase A over gentle heat and stir. Finally mix in Phase C over low heat. Stir well and pour into containers at about 70C. The resulting product is a little soft for a stick, but you can try it. Here is the colors swatched. You can see that, as a blush should, it has a certain amount of translucency. Its not a heavy "one color". One adds more as you build up the application. Raw materials available at tkbtrading.com!